Laureus: Congratulations on your Nomination. What does that mean to you? Wayde van Niekerk: It’s just been a blessing to myself and yet another milestone or achievement I can tick off, knowing that I have been nominated for such a massive award. My focus has been to go out there and represent my country. I thank everyone that has supported me to where I am today. It’s exciting because I get to see all the other Nominees in all the other categories. It’s been a massive surprise and a great great honour just to be nominated. Laureus: It was a fantastic performance in Rio, do you have one particular memory from the race? Wayde van Niekerk: I think from that last 50 metres all the way to the end of the race, when I had the opportunity to share the moment with my friends and family and later on with the South African team. Seeing the inspiration that I felt gives me the hunger to keep on wanting to do great things for the country and for my friends. Laureus: Which delighted you more: the gold medal, or beating Michael Johnson’s 17-year record? 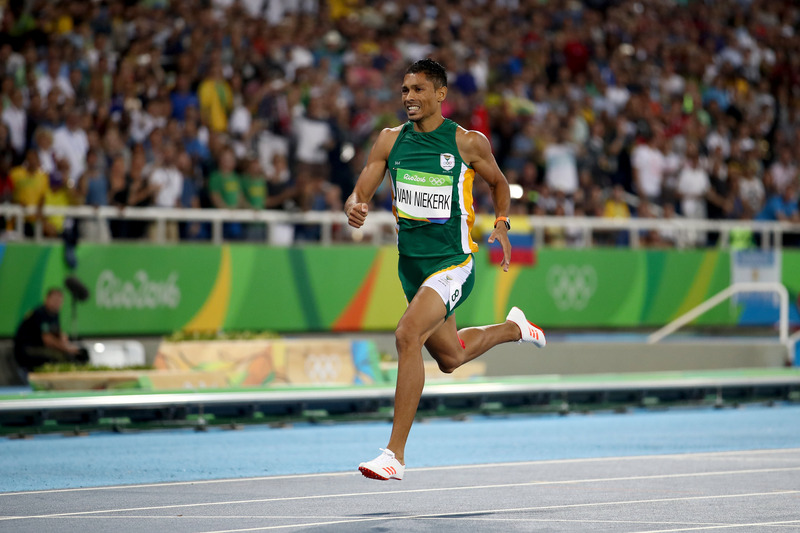 Wayde van Niekerk: I don’t think you can put them together in the same category, but to me I feel that at the age of 24 it was just another stepping stone. I don’t want to dwell too much around the fact that I won the Olympic gold medal and broke the world record because I have so much more to do as an athlete. Right after the Olympics so much has changed in my life, I can put my family and friends in a better position and give them a better life and that’s my biggest motivation for wanting to continue what I’ve done. Laureus: Before the race, did you think there was a possibility you would break the record? You had to beat Olympic champions LaShawn Merritt and Kirani James? Wayde van Niekerk: I struggled with an injury in the year and I just wanted to give that final race my everything, and that’s what I did. I had so much respect for the competition. Not just LaShawn Merritt and Kirani James, but there was a full line-up of quality guys and real professional athletes that I respect so much and I went out there and showed my respect by putting out a competitive race. Laureus: What can you say about Laureus Academy Member Michael Johnson, whose record you broke? 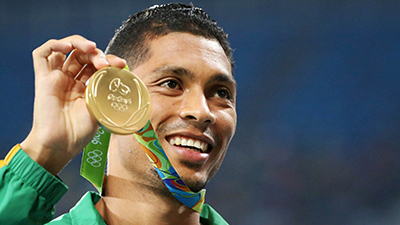 Wayde van Niekerk: To be honest I was not a massive 400 metres fan when I was younger. I was more attracted to the shorter distances, but I got to know the 400 more and he’s definitely been a great part of track and field and it was a massive honour to be able to chase down the times that he set out and I am really grateful that it is now under my name. Laureus: Who was your role model when you were younger? Wayde van Niekerk: It was the people I interact with every day and that is my family and my friends. Laureus: You are only 24. Do you have a career plan of what you would like to achieve? Wayde van Niekerk: I definitely won’t be neglecting the 400m. There is so much more I can achieve in the 400m, but at the same time I want to go back to why I started in track and field and that was the 100m and 200m. I’d like to put more effort there and try and achieve great things within my event and within the 100m and 200m as well and try and rewrite whatever history I can and have as great as possible performances as I can. Laureus: What are your targets for 2017? Would winning a Laureus Award be a pretty good start? Wayde van Niekerk: It would definitely be. Many times my friends say to me that 2016 was a pretty good year, but for me 2016 was just a stepping stone. I would love to make 2017 an even better year. Laureus: You are in an interesting category. What do you think of the competition? It’s unusual. Wayde van Niekerk: Definitely. I can go through the line-up and tell you how every sports person and sports group have inspired me. You can start with the Iceland football team and how they fought within the European Championship, and how a small country like theirs really believed. It’s really been massive. And you look at the Fiji team and it’s a small island and I’ve got to meet some of the Fiji guys because I’m a massive sevens fan. They are great guys and individuals. You can see how they can be a great inspiration to not only their country but to the world. Nico Rosberg too is also inspirational, although I’m more of a Lewis Hamilton fan. He fought hard and it’s great to be champion of Formula One, one of the biggest sports in the world. I have massive respect for Leicester City, though I am a massive Liverpool fan. And I know how it feels to break a world record at the Olympic Games and how much preparation it must have taken for Almaz Ayana to break that record [10,000 metres] so obviously I have a lot of respect for her knowing that I went through the exact same circumstances. I have massive respect for them all, so I’ll probably be very star struck at the Laureus Awards.